I recently turned down a research project from a private transportation company. They approached us with an opportunity to do a moderately interesting analysis (nothing earth shattering, but would make a decent MS Thesis). We proposed in response, negotiated, and more or less agreed to the terms of work. As we were entering contracting stage, they wanted approval over what we could publish from the research (not simply being informed of what we were going to publish, and given the opportunity to provide comments, which is fine and simple courtesy, not simple delay, but approval, even after the contract closed). While this is generally unenforceable, we cannot agree to these kinds of terms and maintain our integrity. I understand why they want this. We might say something that is not in the company’s interest. If what we say agrees with what they want said, they would approve, if not, they would squash it. This creates a positive results bias in a way. I belong to a research university not a consultancy. The reason we engage in research is to discover truth. We then make our findings public to add to the store of human knowledge. Further, students need to be able to publish their MS Thesis, both to prove they wrote them, and for their own careers, leave aside adding to human knowledge. I am not sure how people in defense and medicine do research, but transportation is traditionally public sector. We are, I think, cheaper than consultants in general, in part because we have this subsidized student labor, who forego salary in exchange for education, part of which is a research experience, they payoff of which is downstream publication if it is good enough. Students should not be exploited (or let themselves be exploited) this way, where the outcome of their research depends on whether the funder likes the results. My conclusion is that the private firm was in fact trying to buy our credibility (if the “objective experts” at the University of Minnesota say something good, publicize, otherwise bury) rather than our expertise. While I recognize these are jointly produced — our expertise, as demonstrated by publication in peer reviewed journals produces credibility; credibility expands opportunities to obtain expertise — it would not take too many of these contracts before that credibility would be destroyed. Now, I understand other organizations who fund us in a way buy our credibility too. And if they like what we say, they issue a press release, and if they don’t they just ignore it, and leave us to the many readers of Transportation Research part Z. It gets published, it just doesn’t get as widely distributed. That’s fine. No one promised us free marketing for the research. And I also understand that we are not a blank slate, we are more likely to attract some funders than others because of what we are expected to say based on past experience. There is self-selection all around. That too is the nature of the world. I can still publish, they can still choose to publicize or not. But I am not pre-committing to an outcome, and am not changing my analysis based on the desire to be funded. The consequence of turning down this contract is that perhaps one less student got funded to do an MS Thesis in Civil Engineering at the University of Minnesota, and instead went to the next highest ranked university in the field (displacing the weakest student who was admitted there). Maybe this firm found another university to do their bidding. Maybe the displaced student went there. I don’t know. I was interviewed on Marketplace (by American Public Media) about ‘Lexus lanes’ and the price of saving time (this is drawn from the same interview as last week’s article). Part of the problem appears to be a phenomenon documented on Minnesota’s MnPASS system, after which Florida’s I-95 Express plan is modeled. Engineers found that, up to a point, drivers are actually drawn to higher tolls. He says you don’t normally think about driving on high-occupancy toll lanes as a prestige good, where people perceive more value as the price goes up. And for the record, express lanes may or may not be “better” as the price goes up. Dynamic tolling changes to ensure free-flowing traffic in the express lanes — it has nothing to do with what’s going on in the not-so-express lanes. The paper is here: HOT or Not: Driver Elasticity to Price on the MnPASS HOT Lanes. 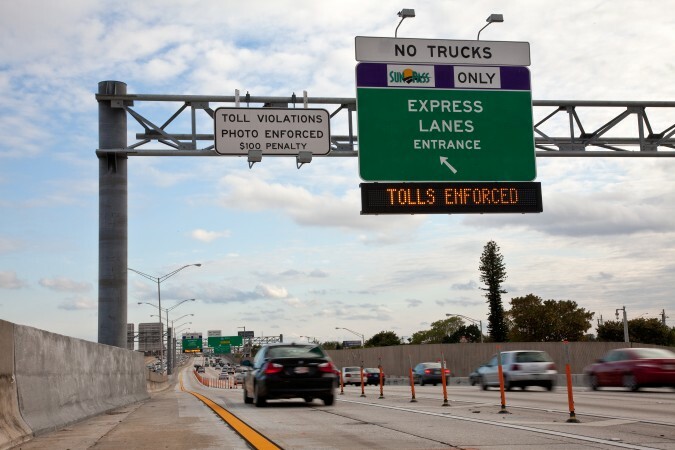 FDOT numbers show that the express lanes, of late, have failed to provide a reliably free-flowing trip during peak traffic hours, most notably the 4-7 p.m. northbound trip. Part of the problem appears to be a phenomenon documented on Minnesota’s MnPASS system, after which 95 Express is modeled. Engineers found that, up to a point, drivers are actually drawn to higher tolls. FDOT is seeing evidence of the same thing, drivers assuming a higher toll means more time savings. ￼￼The principal investigator for that project is the University of Minnesota’s John Hourdos, director of the Minnesota Traffic Observatory, who feels that even today HOT lanes are still a relatively new concept. “Although technology enables ideas on pricing to be implemented, in only a few cases is the effect on a driver’s lane choice fully understood,” he suggests. Given this knowledge gap, Hourdos says the project is aiming to not only understand and improve the MnPASS pricing algorithm itself but – at a more holistic level – to build a simulation tool for testing and evaluating a pricing strategy on any freeway (see Effective measures sidebar). “In a surprise finding, University of Minnesota researchers say that motorists who pay to drive in the carpool lanes on Interstates 35W and 394 are more likely to use them when tolls are high and to travel in the general traffic lanes when prices are low. They also found that drivers who use the HOT lanes (High Occupancy Toll) are paying $1 to $2 per minute to save time. That’s more than $60 an hour. Authors David Levinson and Michael Janson concluded in their ongoing study that drivers use the advertised toll price at entry points as an indication of the severity of congestion in the general purpose lanes and are more likely to use express lanes when prices are high to avoid sitting in traffic. MnPass uses dynamic pricing, meaning the cost to drive in the HOT lane changes based on traffic conditions. Prices range from 25 cents to $8 and are adjusted every three minutes based on conditions. The average price is $1.50 to $2, said Brian Kary, MnPass freeway operations engineer. Kary said he agrees with the study’s premise that drivers use toll information to judge how bad congestion will be downstream, but that there is a point when people will stop paying. MnDOT research indicates HOT lane use starts to drop off when the price hits $5. The U study did not indicate at what price HOT lane usage increased or decreased. Levinson and Janson calculated time savings and found that drivers in the I-394 HOT lane saved about 1.7 minutes in the mornings and about one minute in the afternoons. Time savings on 35W were about three minutes in the mornings and 1.2 in the afternoons. Motorists use HOT lanes on average two to three times a week, Kary said. And even though time savings might not be that significant, there are other tangible benefits. 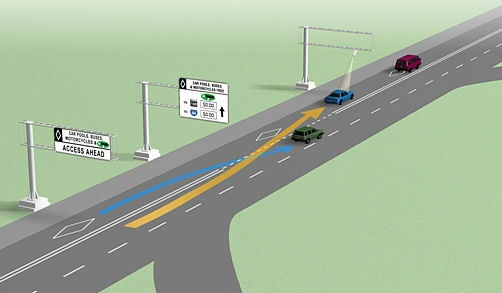 HOT lanes provide an absence of stop-and-go traffic and predictable travel times. It also provides for a lower-stress commute. “You don’t have to worry about having to leave 10 minutes early to be to work by 8,” Kary said. Everyone thinks the losers will be commuters priced off the roads. But consider the poor parking garage owner, who will now have to lower their rates to attract back customers. I wouldn’t be surprised to see parking prices drop almost as much as congestion charges rise, meaning only “through trips” (New Jersey to Brooklyn, Queens, or the rest of Long Island) would be truly priced off the road. We returned from a road trip from Minneapolis to Pittsburgh last night. We went to Pittsburgh to attend the lovely wedding of Jason Hong, a friend of ours from Berkeley quizbowl, who is now a computer science professor at Carnegie Mellon University. We stopped for the night outside Toledo on the way there and outside Milwaukee on the way back. Random observations in roughly chronological order.